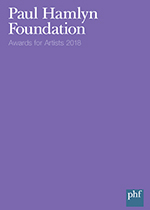 Paul Hamlyn Foundation launched Awards for Artists to provide individuals with financial assistance at a timely moment in their careers. This unique scheme has now been running for 24 years and has benefited more than 160 artists with funding of over £6.5m. Originally supporting a range of art forms, the current scheme focuses on visual artists and composers. Five awards are made to visual artists and to composers each year. The Awards reflect the Foundation’s strong belief in the value of artists to society. The scheme aims to give artists the freedom to develop their creative ideas and to grow both personally and professionally.